Every year June comes in with a bang. Tourism picks up again after the May Doldrums and of course the humidity feels more like Florida than Puerto Vallarta, welcome to our tropical climate amigos. With the warming air temperatures and humidity comes world class fish like Sailfish, Monster Yellowfin Tuna, Dorado and of course Black and Blue Marlin. Striped Marlin will be moving out gradually as the water temperatures increase, they prefer a touch cooler water temps. For the Angler who is looking for a world record fish, it can be had, if you´re lucky and have the means. 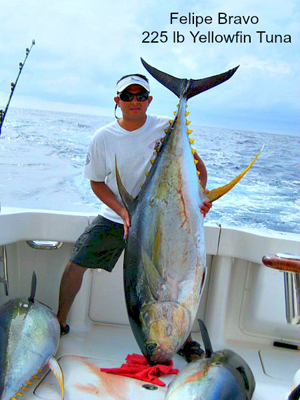 El Banco and of course points in between will see Yellowfin Tuna running on average from 125 lbs to upwards of 400 lbs. 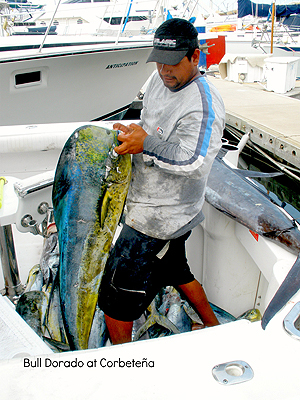 and of course Bull Dorado will invade our fishing grounds. As water temperatures continue to increase with warm currents as the sun that lingers longer in the day, Black Marlin (the rarest of all Marlin Species, save White Marlin) will setup house and be abundant for those willing to put the distance in. As the children of our visitors get out of school, tourism flow increases like blood through your veins. Along with the families that visit our little corner of paradise, so does the seasonal rains. Beginning mid to late June, the evening rains are a breath of relief from the at times stifling humidity. This is a blessing to the locals as it beings some relief for a few hours. Also with the rains comes Snook at the river mouths waiting for the free meals and the ¨Trash Line¨, famous for drawing all sorts of species to chow down on free and easy organic ¨fast food¨. Watching the Rainstorms or just Spectacular Sunsets from El Faro Bar at the top of the light house in Marina Vallarta is a great place to share a drink and listen to some live music on Puerto Vallartas other Malicon. Or visit any of the 15 restaurants on the boardwalk under protective cover as you stroll exploring. Welcome to Puerto Vallarta’s second season, the season of the sun! If you live in Puerto Vallarta, You can´t call yourself a local if you have never experienced a summer in Puerto Vallarta!